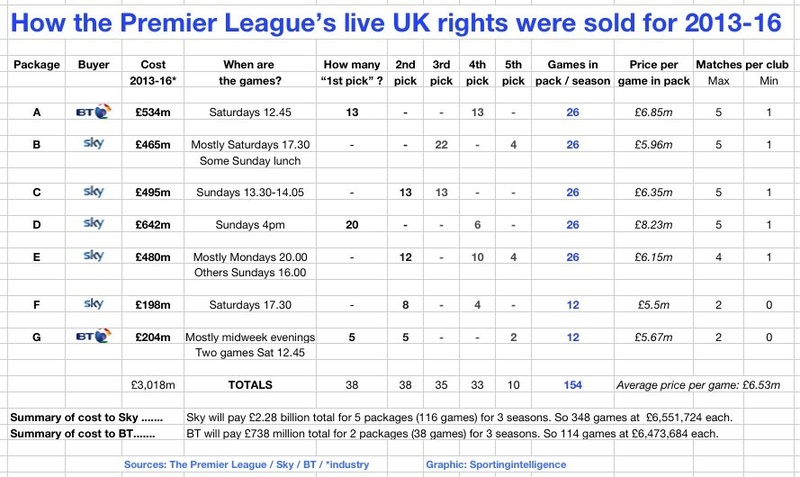 A companion piece to this article was published on Sunday (linked here) to consider the business thinking behind the big bids by Sky and BT for Premier League rights for season 2013 to 2016. It concluded that ownership of the rights is not an end in itself – to make cash from subscriptions – but strategic, to help gain or increase market share of the UK’s telecoms and TV customers. That article includes a table – updated on Monday morning – that explains how Sky and BT split the seven packages of live rights, with educated estimates of what they paid for each package. You can see that article here. 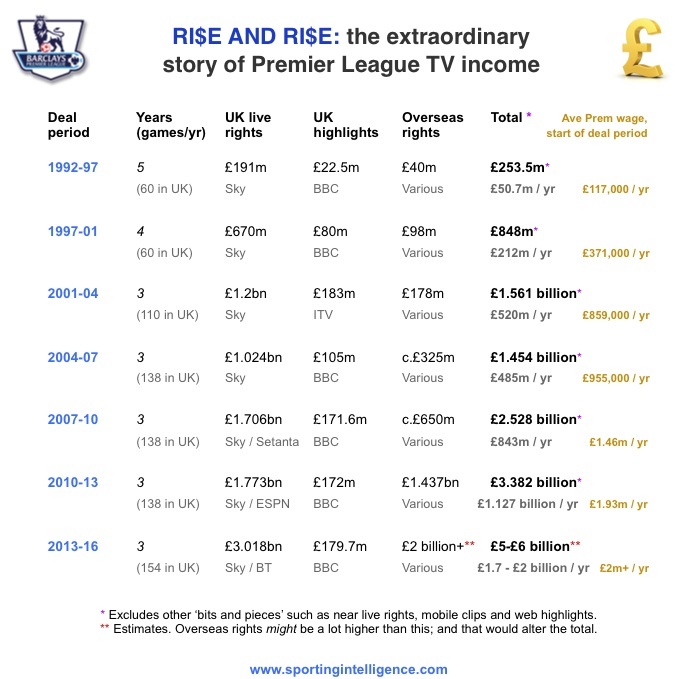 At the bottom of it there is also a table showing how the Premier League’s total TV revenues have grown from £50.7m per season in the period 1992 to 1997 to more than £1.1bn per year in 2010-13. When all the overseas rights for 2013-16 are sold, total Premier League broadcast income is expected to be between £1.7bn and £2bn per year from 2013 to 2016. The first article prompted numerous questions from readers, which should be addressed below. This second piece also explains where the money goes, how the TV companies get to pick which games they screen, and what might happen in future rounds of rights sales. Q1: How is this TV money shared out? A1: In the current TV deal cycle for the three seasons 2010-13, the Premier League’s TV deals pour around £3.5bn into central funds, or about £1.17bn per year. The League’s running costs are deducted, and some cash is given to a variety of other bodies from the PFA to the LMA, the Conference, the Football Foundation, the Football League, the referees’ body and charities. But the vast majority remains to be split between the 20 clubs, with other former PL clubs receiving ‘parachute’ cash too. At the end of the 2011-12 season, the pot of cash for the clubs was £1.055bn. Of this, £968.2m was split among the 20 clubs in the Premier League in 2011-12, and the small balance split among seven clubs still getting parachute cash. All cash from overseas TV rights sales is split evenly among the clubs: that was worth £18,764,644 per club in 2011-12. The domestic cash is split three ways: 50 per cent ‘equal share’, 25 per cent dependent on how many times a club was on TV (facility fees) and 25 per cent dependent on where a club finished in the table (merit payment). The bottom club, Wolves, got a merit payment of £755,062 for finishing in 20th place, and Blackburn got twice that much for finishing in 19th place, and Bolton got three times that for 18th place …. and so on up to Manchester City who got 20 times that much (or £15,101,240) as merit payment for finishing in first place. When you add up each club’s equal share of overseas money, and various shares of domestic money, you get the distribution as shown in this first graphic. The highest earning club from central TV funds alone was Manchester City with £60,602,289, and the lowest earning was Wolves with £39,084,461. If you want to see the official Premier League document that details these payments, it’s contained within an article elsewhere on this site, linked here. That document also details club by club parachute payments. For the distribution of central funds in 2010-11, it’s linked here. For the distribution of central funds in 2009-10, it’s linked here. Q2: Is this a fair way to share the cash? A2: It certainly holds its own for fairness against the top divisions in all the other major leagues in European football. The ratio of ‘fairness share’ between City (£60.6m in 2011-12) and Wolves (£39.1m) was 1.55 to 1 in the Premier League. Or in other words City got 1.55 times as much from central funds as Wolves. In Spain, where Barcelona and Real Madrid do their own TV deals and don’t share the cash and leave the rest of La Liga to feed on scraps, the ratio of distribution is currently about 14 to 1. So Barca and Real scoff 14 times as much as the lesser clubs in La Liga. That’s why they’re so stonking rich and can pay the world’s highest wages. In Italy’s Serie A, the ratio is about 10 to 1, in France’s Ligue 1 it is about 3.5 to 1, and in the German Bundesliga it is 2 to 1. So the Premier League is fair by that measure. Whether the Premier League should give a much bigger share of its money to clubs across the whole English game is another – much more contentious – debate altogether. Q3: Will the league’s new deals with Sky and BT for the seasons 2013-16 change the amount the Premier League clubs get? Those deals, announced last week and worth a staggering £3.018bn over three years, will give all clubs in the Premier League a healthy boost from the 2013-14 season onwards. Details in a moment. But until the Premier League have sold all their overseas rights for the 2013-16 period, we won’t know how much that will also add to the distribution pot. In 2010-13, the Premier League made £1.437bn from overseas deals. The earned £190m for the rights in Singapore alone, and £225m from the Middle East, and £146m in Hong Kong, and £111m in Scandinavia, to name just a few of the largest regional deals. In all the league did around 81 separate deals overseas, country by country or region by region. It is virtually certain that there will be decent overall growth from the £1.437bn overseas total for 2013-16, and the Premier League expects to know that total by the end of October 2012; it continues to negotiate contracts around the world. The next table below thus paints five different scenarios, each based on a different level of increase to the overseas TV income. For the sake of simplicity, I have used the 2011-12 clubs and finishing positions to illustrate the point – and the income growth. Scenario 1 is that overseas income doesn’t grow at all, and remains flat. If that is the case, Manchester City’s like-for-like income for winning the title will jump ‘only’ £29.2m as a result of the new Sky and BT deals, from £60.6m in 2011-12 to £89.9m in 2013-14. At the other end, the bottom club’s money will jump ‘only’ £14m, from Wolves’s £39m in 2011-12 to £53.3m in 2013-14. But this really is a worse-case scenario. If overseas income jumps 30 per cent, the winning club’s central TV income is likely to jump from City’s £60.6m in 2011-12 to £95.5m in 2013-14. If overseas income jumps 50 per cent, that goes up to £99.3m, and if it jumps by the same 70 per cent that domestic income has jumped, then it goes to £103m. And if it doubles, the Premier League winners of 2013-14 can expect around £109m from finishing top while the bottom club might expect some £72m, or £12m more than the highest club in 2011-12. These are numbers to make the head swim. Of course there is an ‘if’ factor in the overseas money. Personally, I would expect the rise to be around 50 per cent. It could be lower but there are signs of growth in key areas in the Middle East, parts of Asia and in North America. And in the first overseas deals already signed for 2013-16, for Premier League games to be shown in Sweden, Denmark and Norway, it is understood they will earn the League around double what they earned last time. In 2010-13 in Scandinavia, the League sold the regional rights to an intermediary consultancy, Medge, for £111m, and they sold then on to individual countries for almost double that, according to industry sources. This time the League has sold the rights direct to Viasat (for Sweden and Denmark) and to TV2 in Norway, for what is believed to be a rise in what those broadcasters paid Medge collectively last time. So the Premier League has almost certainly doubled its income in that one region. As and when other foreign deals are done, we’ll cover them on Sportingintelligence. Anyway, here is the five-scenario table, depending on how much overseas income increases. The sums would be broadly applicable in each of the three seasons from 2013-14. Q4: Is Premier League TV income a club’s main source of cash? A4: It varies hugely. For many of the ‘smaller’ clubs, this central TV cash amounts to a large proportion of their total income. Blackburn Rovers’ income for 2010-11, for example, was £57.6m, and £42.1m was from the Premier League, so a whopping 73 per cent came from the League. Some clubs have an even higher percentage. One might say they are dangerously reliant on staying in the Premier League. But Manchester United’s income for 2010-11 was £331.4m, of which £60.4m was from the Premier League, or only 18.2 per cent. So for the big clubs, Premier League money is only a smallish chunk, although growing rapidly. The ‘big boys’ in the Champions League will also be making tens of millions there, and all clubs have match day income (tickets, hospitality) and commercial income (sponsors, merchandise). Q5: Will parachute payments change with the new TV deals. A5: Probably, yes. They have tended to grow as the overall pot has grown. 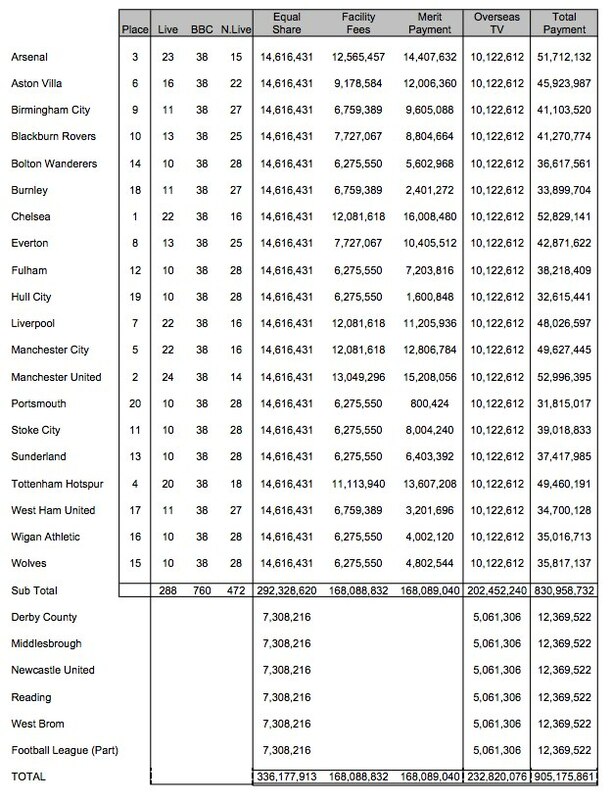 As things stand, relegated clubs get £16m in their first season ‘down’, then £16m the next season, then £8m and £8m for a total of £48m over four seasons. This is expected to grow when the deals grow but no firm decisions will be made for a while yet. 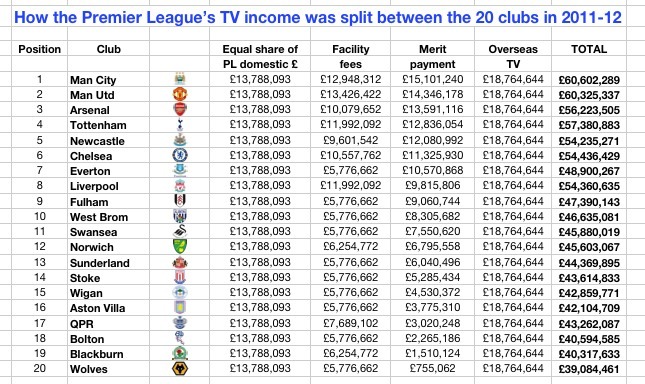 Q6: Does the Premier League have any other income it shares out, aside from the TV money? A6: First, a clarification of all the elements of the TV money. They comprise live UK rights (Sky and BT from 2013-16), UK highlights rights (Match of the Day) and overseas rights (all kinds of separate deals around the world). See how these amounts have changed over the years in this graphic. On top of that, the League also sell ‘near live’ rights, which have yet to be sold for 2013-16 but fans will be able to catch up on whole games shortly after they’ve been played, and also access (via a new deal) a ‘vault’ of whole games from the past. And on top of that, there will be a combined ‘mobile and clips’ deal up for grabs for 2013-16, so a mobile firm or internet operator or a combined group involving both will buy the rights to show highlights and goal clips via mobiles and on the web. So that’s all the ‘broadcast’ revenues that the League have. Then they also make money from Nike for using a Nike ball (worth around £6m per year to the League). And they sell headline sponsorship of the League. Barclays pay £82.5m to be the current sponsors for 2010-13, or £27.5m a year. Incidentally, Barclays have an exclusive negotiating period to retain that deal for 2013-16 that ends soon. If a new deal isn’t announced imminently that deal will be up for grabs. The Premier League also earn money from radio rights, and from a range of commercial deals with EA Sports, Topps trading cards and Lucozade. These bring in millions per year, each. This commercial income, on top of the broadcast income, brings in something like £50m a year and rising, and the clubs share it, at roughly £2.5m per season each. Q7: In the 2013-16 domestic deal, how exactly will the ‘first pick’ system work? A7: The graphic linked here shows how the 154 games per season will be divided between Sky and BT. Sky have five of the seven packs of rights and 116 games per season, including 20 ‘first picks’ to show on Sundays at 4pm. BT have two packs of rights and 38 games per season, including 13 first picks for Saturday 12.45pm and five first picks for midweek evenings, Bank Holidays and more Saturday 12.45pms. There are 38 games in a season, hence 38 ‘rounds’ of games. Simply put, Sky get the ‘first pick’, or best game, in 20 of those rounds. And BT get the first pick in the other 18. But it’s far, far more complicated than that. Sources have confirmed to Sportingintelligence that Sky have paid a premium for package D, for 26 games at 4pm on Sundays – including all their 20 first picks – because that package also gives them the right to choose which 20 weekends to apply those picks. For reasons that will become clear in a moment, that potentially gives them a huge advantage in snaffling many (perhaps most) of the very best games. But on the flip side, other conditions within the broadcast contracts mitigate that advantage slightly and don’t let Sky get everything their own way. To try to make this clearer using a real set of fixtures, Sportingintelligence has looked at what might happen if the new deals were in place for 2012-13, using the fixtures for the forthcoming season that were released yesterday. Those fixtures can be seen on the Premier League site, at the BBC site and in numerous other places. Purely for the sake of considering what is a ‘big game’, let’s say it can be defined as one where a ‘big six’ club (B6 club) – Manchester United, Manchester City, Liverpool, Arsenal, Chelsea and Tottenham – play another ‘big club’. There are 30 such B6 v B6 games in a season, of 380 games altogether. In the 2012-13 season, there are 34 ‘rounds’ of games at weekends, and four rounds in midweek periods. Sky’s 20 first picks for Sunday 4pm must, by definition, be used within those 34 weekend rounds. And it just so happens that in 12 of those 34 weekend rounds in 2012-13, there are no B6 v B6 games at all. So Sky, one assumes, would elect to operate their ‘first pick’ on 20 of the other 22 weekends, taking the best games on each of these. They’d look the fixture list, surely, and snap up MCFC v MUFC on the weekend of 8 December; and the reverse fixture on the w/e of 6 April; and LFC v MUFC on the w/e of 22 September; and the reverse fixture on w/e of 12 January; they might also look ahead and think AFC v MUFC on the w/e of 27 April looks a decent pick, and MUFC v CFC the next weekend, 4 May. And so on, snapping up the best of the best games with their ‘proprietary’ picks. BT’s midweek rounds would give them a B6 v B6 match on 27 November (THFC v LFC), and on 29 January (AFC v LFC) but there are no B6 v B6 matches on Wednesday 26 December nor on Tuesday 1 January. As far as their 13 ‘first picks’ for Saturday 12.45pm games go, a simplistic view is that most of those will actually have to be picked on weekends when there are no B6 v B6 games because Sky will have got most of those first. But that doesn’t mean they won’t get games featuring the B6, because they all play every week, not just against each other every week. And the reality is that the allocation of games via first picks is much more complicated than a ‘Sky snaffles all’ scenario for a number of reasons. One is that there are limits on how many times a single team can appear within each ‘pack’ of games. So any one team can only feature a maximum of five times in Sky’s Sunday 4pm slot. So in fact Sky couldn’t snaffle all 30 B6 v B6 games for that slot, even if the fixture list were spread to allow it, because that would mean each team appearing 10 times in that slot. Equally, Sky and BT have to feature every team in the league at least once in each of their main packages, so that constrains things. Example: Sky’s 26 Sunday 4pm games in package D will involve 52 sides in those 26 games. Suppose Sky used the B6 clubs five times each in that slot (for 30 clubs of 52 involved in those 26 games), they still need 22 other teams involved in those games, including at least one appearance from each of the 14 non-B6 clubs. At best, then, Sky’s Sunday 4pm slot, could have 15 matches solely B6 v B6, plus 11 matches involving combinations of the 14 teams outside the B6. The reality is it will be something in between, not least because other factors such as Europe will get in the way and effectively dictate when some sides can or can’t play particular time slots. Extrapolate the picks system across all seven packages with all their myriad conditions and it’s enough to give anyone a headache working out how the games will be divided. All kinds of other variables could deal Sky or BT better hands in the three seasons from 2013-14. The fixture computer might feasibly throw up five midweek rounds in one of the seasons, where the biggest B6 v B6 games are all placed within them. That would hand BT all those games because Sky have no midweek games. And who can actually guarantee that by 2013 or 2014 or 2015 that we will perceive the B6 as the same B6? What about Newcastle, Everton, Aston Villa, Sunderland, Fulham? Imagine if one of those were bought by Qatari billionaire interests with an ambition to ‘do a Chelsea’ or ‘do a City’ and found a way to fund it that worked within Uefa’s FFP rules. What we can say is that Sky clearly retain an advantage in getting many of the very biggest games. But BT, with 38 games a season across Saturday 12.45pm and midweeks, should have access to enough ‘big’ games to give them all kinds of drawing power that Setanta and EPSN have lacked as the minority rights holders in the past. Q8: But isn’t the 12.45pm slot a poor slot for audiences? A8: Just because it has attracted fewer viewers in recent years (1m viewers per game very roughly) than other slots (2m a game), doesn’t mean it has to be a poor slot. One might reasonably argue the broadcasters with that slot have had poorer games, so lower figures. With better games, they could rise. It all depends on the viewing proposition that BT delivers, and at what price. This is BT’s key challenge, to deliver a sports channel that football fans will want to pay for because it has enough ‘big’ action to warrant the spending. Sources have also confirmed that BT is highly likely to market itself directly to the pub and club trade rather than ‘piggy back’ on Sky’s pub and club deal. This is a massively lucrative market. If BT can carve itself a healthy chunk of income from selling to public space venues, that will also alleviate pressure to add sports channel subscriptions. And in any case, this BT venture is much more strategic that just flogging a sports channel, as outlined earlier this week. Question from YellowtomNpton ‏@YTNorthampton1 Where are BT going to show the games? A: On a new ‘football focussed’ sports channel. Let’s call it BT Sport; the name is not actually decided yet. BT Sport will carry live Premier League games, 38 of them per season, as its prime content, and BT envisage they will also have other live sports rights. These will depend on what BT can buy. The cost of subscribing to the channel hasn’t been decided. Media reports of £10 per month are pure guesswork. It will probably vary depending whether you buy it as an existing BT customer, or a new sign-up or via another platform, or as a mobile tablet subscriber. It is certain to be available in numerous ways at different prices. Question from SuperCoolEskimo ‏@SuperCoolEskimo Will you be doing a piece on the numbers for overseas rights once they’re sold? A: Yes. See this piece about the 2010-13 auction for overseas rights, written near the conclusion of that sale, for a flavour of the diversity of that sale. And also see Q&A No3 above. Question from Mohamed-Yamin ‏@Mohamed_Yamin Why didn’t Al Jazeera bid for the UK rights? What’s your point of view? A: I think they considered it and decided against. They certainly had a look at the tender document. Why decide against? Because they’re new to live domestic rights and have a project in France to handle first, perhaps. Maybe they also want to focus resources on winning the Middle East rights this time. If we assume that Qatar-based Al Jazeera are interested in rights mainly to demonstrate football ‘creds’ ahead of the 2022 World Cup in Qatar, they still have lots of time to enter the UK market, say in 2016 or 2019. I was told they would most likely have bid for live Premier League rights this time if they’d been sold on a Pan-European basis, snatching a whole continent in one go. My assumption is that getting just the UK at a high price wasn’t deemed good value for them. Yet. Question from Rich ‏@RichCollArsenal Has anyone done a projection of how much extra money this will generate for Arsenal over the three years?!? A: See the graphics in Q1 and Q3 above. Arsenal made £56.2m from Premier League TV cash in 2011-12. I project that if they finished third in 2013-14 (or indeed in the two seasons after that), that would rise to £82m in a worse-case scenario of overseas deals staying flat, and climb as high as £101m if overseas deals double. So you’re looking at between £26m and £45m more income per season from this one source alone, even more if you finish higher than third, less if you finish lower. Questions from You Are My Arsenal ‏@YouAreMyArsenal Are the proceeds distributed evenly to the clubs? Do clubs at the top get a bigger slice of the pie? A: See Q1 to Q3 above. Question from Cali Mag ‏@CaliMagNUFC Do you know when the rights in the US get decided? A: Different broadcasters are looking at it now. It will be done October latest, perhaps much sooner. The deals in all the non-UK territories are effectively in progress. Questions from Craig Morgan ‏@MrCraigMorgan Why did Sky pay almost £60m more for pack D than BT for pack A (aside from seven more first picks)? Are BT’s 13 first picks from pack A restricted to, say, weekends prior to Champs League midweeks, and Sky’s 20 not so? A: I’m not sure about that £60m more figure; we can only make educated estimates. See article on Sunday for details. But Sky did pay a premium because they get first pick in 20 games and they get to choose which weekends they use those first picks, which also answers the second question. Question from Richard Jones ‏@rlwjones What does all this mean for ESPN’s future in the UK do you think? A: They will take stock and consider their long-term ambitions. Remember though that they still have a season of rights to show in 2012-13. And ESPN are the world’s largest sports media firm, a subsid of Disney, which has revenues of tens of billions. They remain massive players in many parts of the world and are far from reliant on UK business. My guess is they’ll maintain a UK presence with a channel or two and see how the market unfolds in the next bidding round in 2016. They could come back into it at some stage. Who says 154 games per season is the limit, for example? What if 200 are shown in future deals? Or 250? There are all kinds of scenarios that allow multiple broadcasters in. Question from john carlin ‏@johncarlin80 Does that now mean every1 will have sky tv and also bt vision? I need more plug sockets. A: Not necessarily. Like now, you’ll be able to buy the relevant sports channels via different platforms. But of course it will generally make most sense to a consumer to have one primary provider (of internet / phone / TV) and through that provider buy the other channels you want. BT’s entry to this market shows they want more people using them as a prime provider. And they want more of their phone-only customers to take a wider range of goods. And ideally they want some Sky and Virgin customers to move to them, and they think having the football could help them. Question from Sami Herniä ‏@SamiHernia [The figures are] astonishing. And, it seems to me, it makes gate receipts increasingly less important as it’ll go down as a % of club revenue. If I’m John Henry, Levy, et al, it decreases my incentive to build a new stadium, no? A: Gate receipts are already only a tiny part of some clubs’ income, but that tends to be the smallest clubs. In theory your notion is correct, more TV money makes clubs less reliant on gate money. But with the big clubs you mention (Liverpool, Spurs), actually the TV money remains relatively less important, and all clubs want to maximise their match day income. And to do that, you want the biggest stadium you’re able to fill at the biggest prices you can persuade people to pay. Question from Roger Blitz ‏@rogerblitz Would be interested in what you think will happen in 3 years’ time, assuming BT gets the subscription numbers it hopes for. A: I think if BT get the result they want, which will be a decent growth in customer base that is taking multiple services from them (phone / net / TV / sport), then they will persist with wanting the same or more rights in future years. And if they do that, then the value will be maintained or grow. If this latest round of bidding has shown anything, it’s how desperate Sky are to retain the rights, hence the big hike in value. Sky can say until the cows come home that they have a diverse portfolio of goods that customers want. But they know and we know – and they have just showed – that keeping Premier League rights is crucial. Seven million of their 10m customers subscribe to the football. We also know BT bid this time for more than they got. If they see solid growth as part of a wider strategic plan in 2013-16, what’s to say they won’t try for a knockout blow on Sky in 2016? And if Al Jazeera also come into it seriously in 2016 to give a three-way auction, or more if other firms like ESPN step up, then the Premier League is in clover as well as in the money. A: Yes, I guess so. BT are taking a risk spending £738m over three years. But clearly it is a calculated risk. The upside it very up. The downside is a hit of £200m-plus for three years which in the grand scheme of things they can weather. In the worse-case scenario they don’t bid again. I suspect it will work as a proposition for them. Question from Charlie Tuff ‏@FearlessFred Is that level of money/game for the Prem sustainable? A: See Sunday’s article for a breakdown of how the rights cover themselves largely, even before a subscription is sold. That’s here. Question from Ayan Chakraborty ‏@ayanc_99 How many subscribers does Sky have and how much per subscriber will Sky recover? A: Sky has more than 10m customers, of whom around 7m subscribe to its football channels. Very crudely, if those 7m people pay £500m per year each for Sky, that’s £3.5bn per year into Sky’s coffers from ‘football’ customers. Sky will be paying £760m a year for the rights from 2013 to 2016, and can probably expect to get around £400m per year of that back from selling to pubs, clubs and other outlets and from ads and sponsorship related to their coverage. So – in very broad terms – they’ll be paying around £360m a year for the rights, in effect, to get £3.5bn a year in income. And that’s if they don’t put their prices up. These are crude and broad brushstroke numbers but you can see how it stacks up for Sky. Question from Ashburton Grove ‏@ashburton_grove Stupid question: how does the first pick system work? A: Not a stupid question at all. A very important question. See Q&A 7 above. Question from william sanderson ‏@youcantgoback So am I right in thinking Sky has last a lot of the big games? A: Yes and no. Sky now ‘only’ has 20 first pick games from 38 each season, from 2013. And BT will have 18. But see Q7 for complexities. Question from Kal ‏@GoonerKal So, ESPN have lost coverage? Do BBC retain rights for highlights? A: Yes, ESPN have lost coverage completely from 2013 to 2016. And yes, the BBC have already retained the highlights for the same period, so Match of the Day goes on as normal.